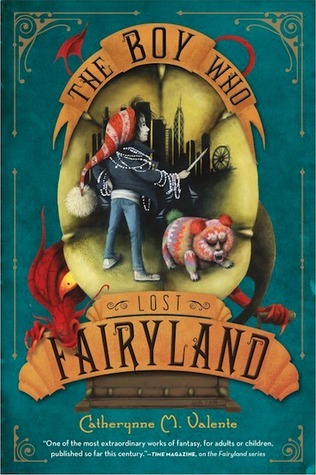 When a young troll named Hawthorn is stolen from Fairyland by the Golden Wind, he becomes a changeling – a human boy — in the strange city of Chicago, a place no less bizarre and magical than Fairyland when seen through trollish eyes. Left with a human family, Hawthorn struggles with his troll nature and his changeling fate. But when he turns twelve, he stumbles upon a way back home, to a Fairyland much changed from the one he remembers. Hawthorn finds himself at the center of a changeling revolution–until he comes face to face with a beautiful young Scientiste with very big, very red assistant (goodreads.com). After reading the previous fairyland book I was a little hesitant to start this one. However, because this one was about a troll who turns into a boy and has to spend his life in Chicago, I thought it sounded pretty entertaining and gave it a try. Boy I am glad I did! This book is absolutely fantastic and made me remember why I love this author! Hawthorn is a troll who was born in fairyland and one day he is taken by the Golden Wind and dumped on the doorstep of a Human family. The most entertaining part of the story was the difficult time Hawthorn (now called Thomas) had in his new life because he new he was different, but forgot who he was. He didn’t understand all the strange rules of his new world, especially school and in order to make some sense of it he writes everything down in his notebook. 🙂 Love this! Eventually, he meets a girl who he finds out is quite a bit like him and together they find a way to get back to Fairyland. They realize it isn’t quite the way they remember it and they need to find the Spinster who they were told could help them. The plot was by far the second most interesting of the series. The first is still my favorite, but this one comes sooo close! I loved everything about the story from how Hawthorne has to get to Chicago (pretty funny), his hilarious time spent there, and how he manages to get back. I even enjoyed the story just as much once he got to fairyland and met a bunch of interesting people. In case you are wondering September and her friends are in this book, but only for the last few chapters. It was interesting during a couple of the interludes to see September’s family and how worried they were when she never returned home. Also, we finally realize how the entire series connects together, September’s purpose, and all about the balance of Fairyland and our world. The ending was spectacular and just left on a complete cliffhanger and now I have to wait half a year or more for the next book to come out! The pace was great as well. I thought there was just enough time spent on each part of the story and I wasn’t in need of any more information (though I wouldn’t have minded). I never felt like the story was rushed or too slow. I also liked that we took a break from September’s story and got to read about something new, but something that is connected to the overall story. There are a bunch of new characters in this book and I really hope we get to see more of them in the last book of the series because I really enjoyed them. A few of them are definitely worth mentioning. Hawthorne (a.k.a Thomas Rood) is a very interesting character and I adored his personality. He loves to read anything that he can, especially books about trolls. He also enjoys destroying things though he doesn’t really understand why. Hawthorne also thinks that everything should be able to talk to him and he doesn’t understand why nothing does. It really doesn’t make any sense to him. His internal struggle of trying to understand everything about his new world was fascinating. I also love his Wombat that his mother makes for him, especially later on in the book. Hawthorne’s wombat is named Bluderbuss and he is hilarious! I love this character and I think he comes second to A-through-L. I think you just have to discover him for yourself. Pretty entertaining. Tamburlaine is the other main character worth mentioning. She is almost as interesting as Hawthrone and she too loves destroying things, but her parents dont like that very much. Instead she gets to paint beautiful pictures all over her walls, which in a way is destroying the wall and her parents don’t mind. So she loves art and unlike Hawthorne she remembers who/what she is. When it is revealed that she is not much of a human girl I found her to be quite marvelous and I don’t want to give away what she is but it is truly amazing. Those are the three main characters worth discussing in this review, although they meet quite a few more. I thought all the characters were well developed, especially Hawthorne because of how much he changes throughout the story. I remember how much I enjoyed the writing of the first book and mostly the second, but I hated it in the third book. This one is easy to understand and isn’t so nonsensical that it is impossible to understand what it going on. This is straightforward, but written so beautifully and perfectly and it just envelops you into the story. Everything is described so well and I was easily able to picture what she was describing. This is why I love this author! Her writing is just so amazing! This was a fantastic addition to the series and put my faith back into it! Now I can’t wait to read the last book of the series and I just love that feeling. If you have been enjoying the series so far or even if you haven’t I think you should read this book. I liked it soo much more than books two and three. It would be appropriate for anyone 8 and older, but may be too hard for a younger reader to read on their own, so it would be a great book to read together! I hope you enjoy it as much as I did.